"These wraps are delicious! Use as much or as little oil and vinegar as you like -- I think it's great with only a small drizzle, but some prefer more. A vinaigrette dressing also works great." Lay the tortilla out flat, and arrange the baby greens across the tortilla. 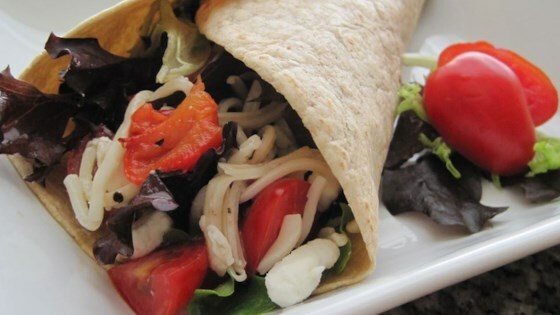 Sprinkle the cherry tomatoes, goat cheese, roasted red pepper, and mozzarella cheese evenly across the greens. Drizzle with balsamic vinegar and olive oil. Fold the bottom of the tortilla up about 2 inches to enclose the filling, and roll the wrap tightly. I used baby spinach instead of baby mixed greens, because that was what I had. I'm not sure the roasted peppers added much to the wrap. Thanks!